This is one of those really random, accidental recipes that turned out SO. GOOD. 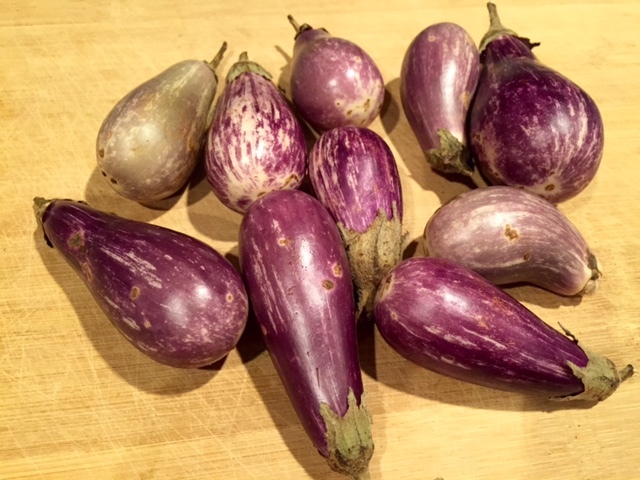 One weekend this summer I was at the farmer’s market and found the most adorable tiny, lavender-colored eggplant I’d ever seen—fairytale eggplant. I had to buy a pound of them, but then try and figure out what to do. After looking up some recipes, I decided that grilling them would be the yummiest. 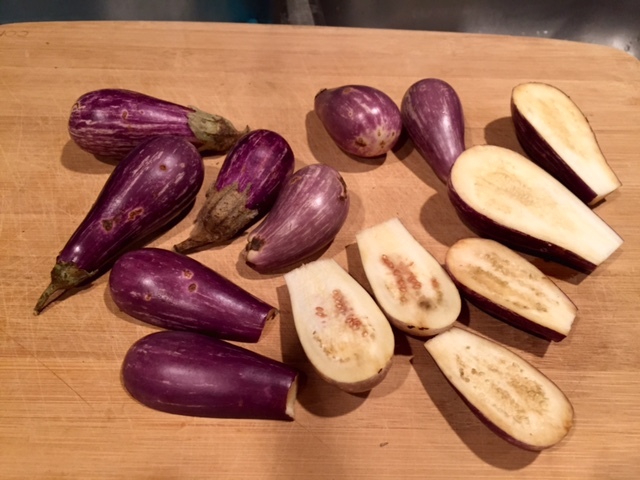 And it was…I’m not a huge eggplant fan, but these were soft and smoky and salty, and just awesome. Of course, if I’m heating up the grill then why not grill some herbed chicken as well? I also picked up some of the last juicy tomatoes of summer, and a bunch of massively fragrant herbs. Because those two things make everything better. And of course, every pasta needs a sauce. Some goat cheese and some pasta water, and boom—instant tangy deliciousness. It was a bunch of random ingredients, but they somehow all came together into an easy, perfect late summer dish. 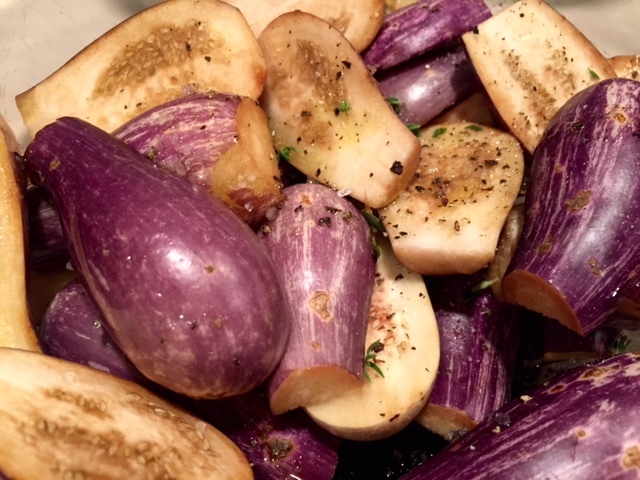 Toss the eggplant with olive oil, fresh-ground salt and pepper, and some fresh minced thyme. If you’re grilling your chicken fresh, marinate it with some white wine, a tablespoon of olive oil, minced fresh herbs, minced garlic, and some salt and pepper. If you’re using pre-cooked chicken, saute in a pan with the olive oil, herbs, garlic, and salt and pepper, and cook for a few minutes until the chicken is warmed and fragrant. 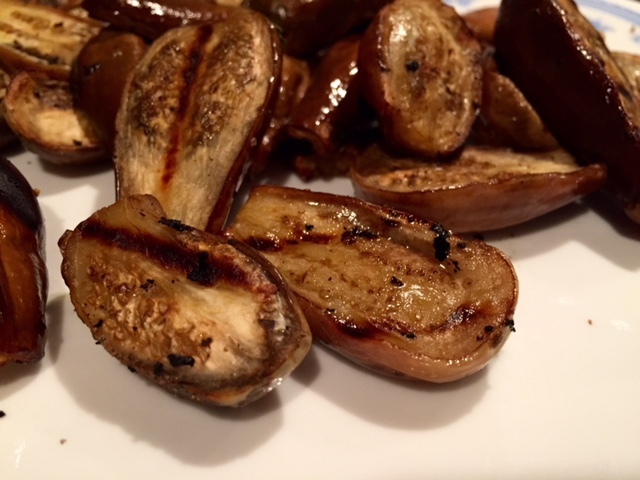 Grill on both sides for about 3 minutes, until they’re charred and the insides have softened. Conversely, if you don’t have a grill, you can roast them at 400 F for about 15 minutes. Grill the chicken until done, and set aside. Let it sit for 10 minutes to get the juices set, then slide into bite-size pieces. 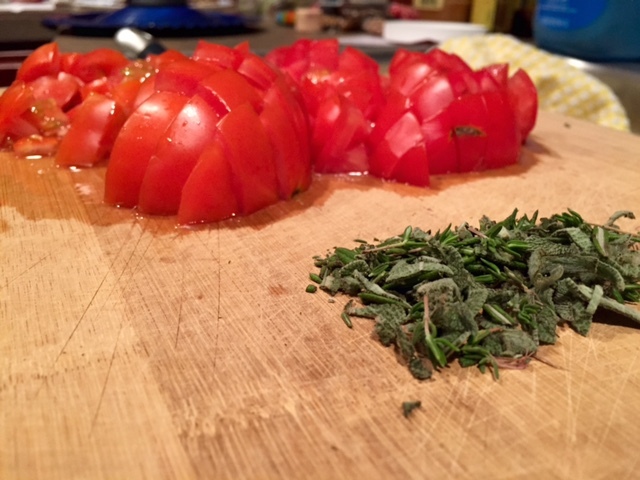 Dice the tomatoes into small pieces and mince the herbs small. 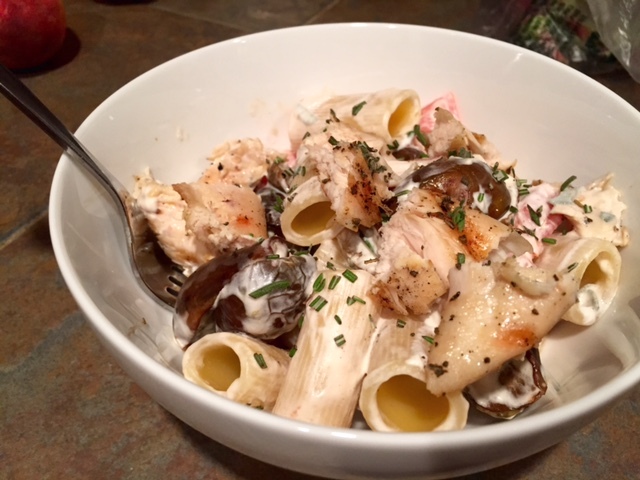 I used the poultry blend, which included sage, rosemary, thyme, and chives. Cook the pasta according to the directions, draining when it’s al dente. Reserve a half-cup of the pasta water for the sauce. 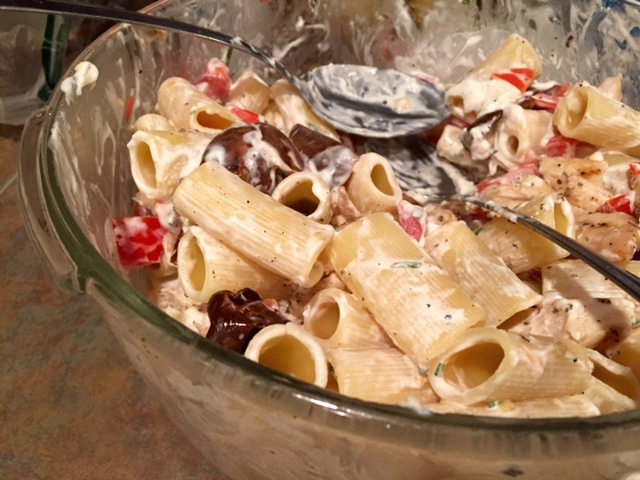 Toss the drained pasta, goat cheese, grilled eggplant and chicken pieces, tomatoes, and herbs together, using the pasta water to help all the elements come together as needed (it helps the goat cheese become a sauce). Serve fresh and hot, with some more minced herbs for garnish. This is shockingly good as leftovers as well! 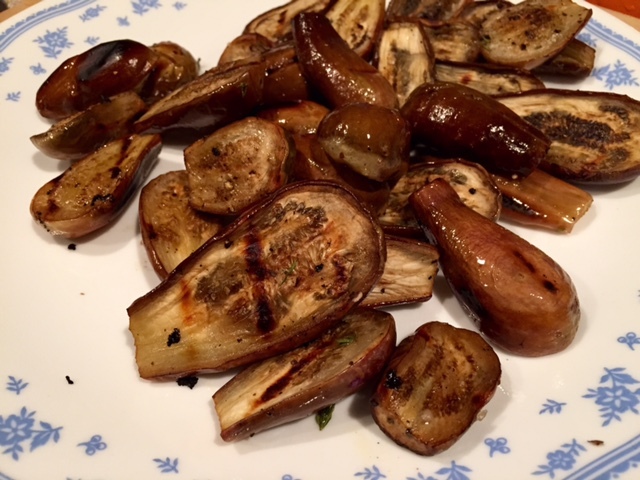 Grill the eggplant on both sides for about 3 minutes, until they’re charred and the insides have softened. Conversely, if you don’t have a grill, you can roast them at 400 F for about 15 minutes. Grill the chicken until done, and set aside. Let it sit for 10 minutes to get the juices set, then slide into bite-size pieces. Dice the tomatoes into small pieces and mince the herbs small. 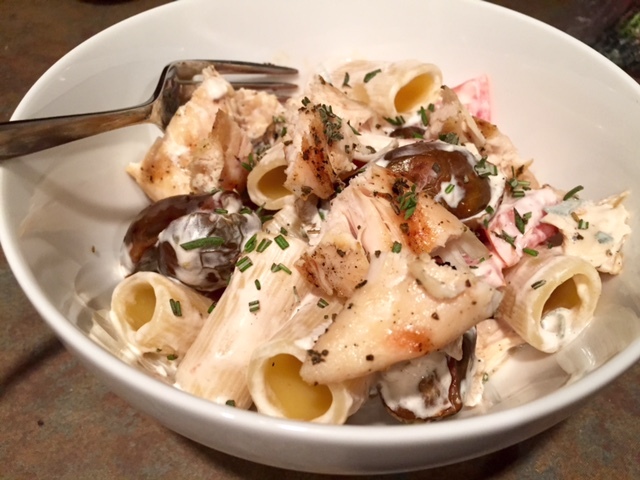 I used the poultry blend, which included sage, rosemary, thyme, and chives. Cook the pasta according to the directions, draining when it’s al dente. Reserve a half-cup of the pasta water for the sauce. 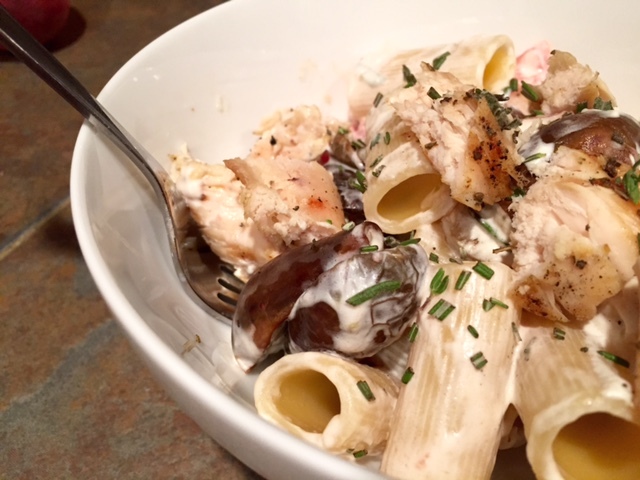 Toss the drained pasta, goat cheese, grilled eggplant and chicken pieces, tomatoes, and herbs together, using the pasta water to help all the elements come together as needed (it helps the goat cheese become a sauce, but you may not need all of it). Serve right away, with additional minced herbs for garnish. Keeps in the refrigerator for up to a week.